This job was very technical and potentially dangerous. 2nd floor timber window which was floor to ceiling height was rotten. Original Window. Rotten frames with 4mm float glass which is incredibly unsafe for the location and size of the glass panels. Not sure when it was made, but very illegal by today’s standards. New clear anodise commercial frame with 6.38 clear comfort plus glass. 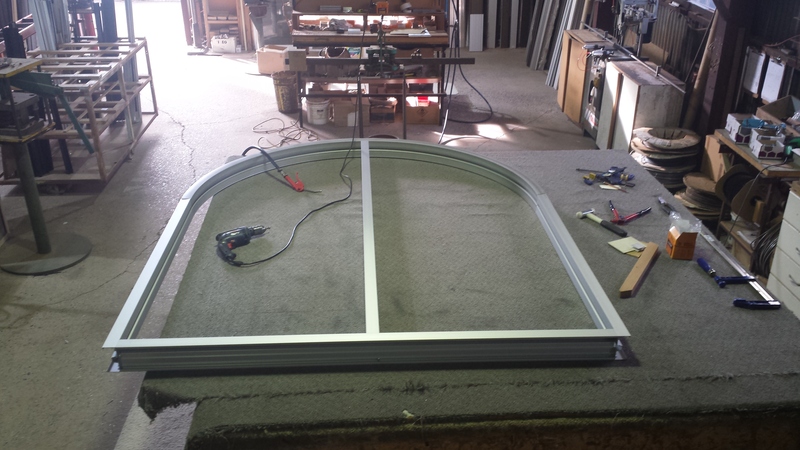 Arched commercial frame with sliding door. The timber facade was for the owner to replace with a new metal flashing. Inside view of the new window / door combination. The balcony is now usable whereas before as just a window it was merely decoration. Glazed with clear comfort plus Low-E glass. We had to erect scaffolding on the outside balcony to remove the existing window. We found the glass to be 4mm float- incredibly dangerous for something that height, and size. Taking the original glass out required delicate care to safely remove.